A trip to the outdoors today and Shakespeare’s Globe for one of my favourites of the Bard’s plays, in Jonathan Munby’s production of ‘The Merchant of Venice’. Jonathan Pryce, last seen on stage by me in King Lear, now plays Shylock, the Jewish usurer who plays Dominic Mafham’s Antonio for a ‘merry bond’ of a pound of the merchant’s flesh should he default on a loan of 3,000 ducats. Antonio himself has sought this loan for his young friend Bassanio (Daniel Lapaine), who, despite being aware of, and repelling, the advances of the older man, still openly seeks his help to woo fair Portia (Rachel Pickup), who is herself trapped in the will of her late father where a successful suitor for her hand must choose a casket which contains her picture. There are many ways a Merchant can be performed. 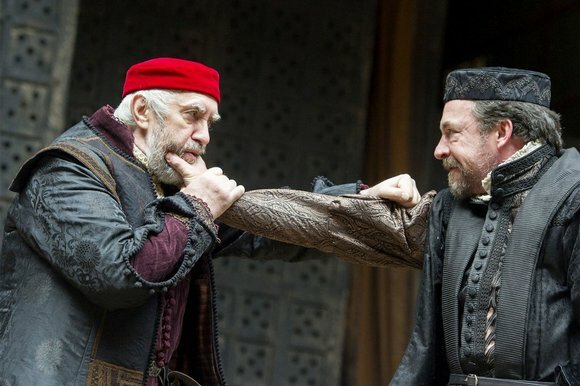 Here, the gay angle between Antonio and Bassanio is very much in evidence, while Pryce’s Shylock is a complex man who reveres his God and Testament (when Antonio dashes it to the ground, Shylock stoops to pick it up, brushes the dirt away, and kisses the volume) while nurturing a hate of Christians which seeks him to eventually sit in court, sharpening his knife, setting out his scales, and almost salivating at the thought that the merchant whose ships have failed might bleed to death at his hand. A non-Shakespearian coda of Shylock’s forced baptism while his daughter Jessica (played by Pryce’s real-life child Phoebe) sings a Yiddish lament, is a moving close to a play which normally ends light with the farcical ring swap sequence between the two couples. It almost swings the pendulum so we feel some sympathy for the Jew, despite his bloodthirsty and uncharitable conduct before the judge. Not that Antonio appears noble and just in this play – in roughly grabbing Shylock by the beard, laughing at his religion, or spitting at his clothes, he appears racist and undeserving of the regard of Bassanio or his wife (disguised as a young doctor, whose eloquence and knowledge – although both founded in the chaos and panic of the judgement in court – save the day). Jessica’s flight from home with jewels and ducats, and her easy conversion to Christianity, flaunting a cross around her neck through the second half of the play, is quickly accepted by the young Christians in this piece, although they still refer to her as ‘infidel’. It contrasts sharply with the obvious distress of the Jew who, judgement given that he must convert, clings to an Antonio who himself was earlier grovelling and crying for his life, with pitiful sobs and moans. For him the loss of his God is akin to the loss of life. In the tradition of other Globe productions, the music gives a special atmosphere to the piece, as does Gobbo’s coercion of audience members to play his ‘fiend’ and ‘conscience’. As Gobbo, Stefan Adegbola gives this play well-balanced comedy, as do the second set of lovers, Portia’s maid Nerissa (Dorothea Myer-Bennett) and Bassanio’s wisecracking companion, Gratiano (David Sturzaker). I also liked the unlucky Princes of Morocco (Scott Karim) and Arragon (Christopher Logan), who chose wrongly in their suit for Portia. Morocco’s greed and Arragon’s foolish vanity are well-conveyed, and both men play their parts well. Mafham is an excellent Antonio, a man who teeters on the pathetic at times, whose life will not be happiness as his idol, Bassanio, is aware of his interest and constantly pushes him away, literally in their embrace where Antonio leans in for a kiss and Bassanio recoils sharply. He may be accepted as friend by Portia but it may break him to see her and the young man he craves being so content together. This is probably Pryce’s show, though, and he is convincing as Shylock, whether isolated in the court, giving the ‘Hath a Jew eyes’ speech, or collapsing from his court bluster to the man who has lost all because of his hate for others. It gives an interesting dynamic to see him act alongside his daughter, and I think he does succeed in portraying all the facets of this complex role.